My BEST gun so far! When i started off with airsoft i used my Classic Army Scar L the gun was absolutely amazing clocking in a 380 fps and 16 rps out of the box! Due to Local CQB field limits i wasn't able to use it in doors so i had to buy a new gun,Black ops Ignite helped me out with an affordable alternative the M4 Viper. Three months go by (after using it for a total of 7 months of shooting semi) and we attend some outdoor fields and my Scar starts having issues such as Reduced Fps,contact switch not connecting and occasional feeding problems...so the search of a new gun began once more. As i Left my Scar in the hands of a tech in our local ProShop i saw a nice G&G Cm16 R8L custom with a nice price tag on it too,but i only had like forty bucks on me so i just put a down-payment on it for the time being. I took that back to the shop and after a brief conversation about the gun the to it back to replace the bucking. Later that night i gotta call that the inner barrel was "snapped" and they had to do more work to it,go figure right? So im thinking to myself Classic Army made a nice gun but the gearbox's don't last long,My G&G Cm16 is great but it should have been almost flawless inside the box not broken,Black Ops is ok but they can be beaten by any airsoft gun off of ebay..so what brand can i trust? Back at the ProShop i spot a Knight's Armament Full metal PDW so right before team practice i buy it so i have something to use,i wasn't expecting much for something ment for CQB on a outdoor field but i was shocked on how accurate the thing was! Only shooting 348 Fps and 10 Rps i was picking players off with no effort and its been a few months without a single problem! Knights Armament to me is the best Brand you can get it handled everything its been through Bad weather,drops,bumps and even getting the hop up shot at! 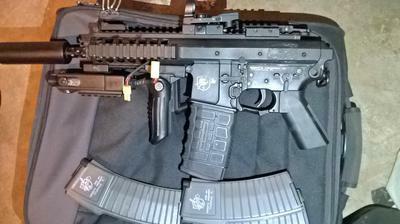 my whole rush squad Knights Armament guns and we have handled any thrown at use because our guns kept up with us. so that's why Knights Armament is my favorite brand.